Choosing Sunflower Varieties | Single-Stem, Branching, Pollenless or "Regular"? Sunflowers are a popular crop, and a great way for vegetable growers to experiment with adding flowers to the product mix. With more than 50 cultivars to choose from, getting started with sunflowers can be a bit daunting. I'll explain some advantages and disadvantages of the various types of cut sunflowers. For those in a hurry I'll cut to the chase: If I had to pick the easiest, most sure-fire variety for a beginning grower, I would recommend the 'Sunrich' series or the 'Pro Cut' series. I will explain why in a moment, but first I'll backtrack to the background information. 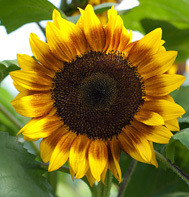 There are two basic categories of cut-flower sunflowers: the single-stem types and the branching types. These two types are so different from one another that I think of them almost as different plants. I personally grow the single-stem types because they are preferred in my market, but I can see where some growers would do better with the branching types. Here are the key pros and cons of each. Single-stem varieties, including the Sunrich and Pro Cut series, are pollenless hybrids, which means they don't drop pollen on furniture, tablecloths, and clothing, as non-hybrid sunflowers do. Note that while pollenless varieties do still produce nectar to sustain nectar-feeding organisms such as butterflies and hoverflies, all bees seek and need both nectar and pollen to survive. If planted in proximity to "regular" (bisexual) sunflowers, pollenless sunflower varieties will be likely to be pollinated to some extent by the pollinators that have visited the regular flowers, and, if left to mature on the stem rather than being cut, will also be likely to produce some seed. Single-stem varieties have strong, thick stems and flowers of substance that make a statement and fill out a bouquet, which endears them to florists. And their vase life is amazing, particularly the pollenless ones — up to two weeks in plain water. On the other hand, single-stem sunflowers produce one flower from one seed. (A few cultivars may send up small secondary flowers in mid-summer, but this is not the norm.) This means you will need to succession-plant every 10–14 days all season if you want to have a continuous supply. (See our 3 sunflower succession planting options for more detail.) If you're selling your blooms, you would need to charge more for them in order to make a good return on your investment. Branching sunflower varieties produce numerous blooms over a long period of time, so they don't need to be succession-planted as frequently. There are numerous unusual colors among the branching varieties, including burgundy, chocolate, bronze, and bicolors. Most of the doubles (more than one layer of petals) are branching types. In other words, this category has a lot of pizzazz. On the other hand, the stems on most branching sunflowers are not as long or strong as the single-stem varieties. Most take about 90 days or more to bloom, and they require a lot of space; they should be planted 18" apart. Their long production time creates more opportunity for insects and disease to attack the plants, but by growing them one is at the same time sustaining the beneficial organisms that rely on them as well. Many branching cultivars produce copious amounts of pollen. (Look for those identified as pollenless if you think this is going to be a problem for your customers.) As a group, the branching varieties are not especially long-lived in the vase, some with only 5 days of vase life. As for my recommendation of the Sunrich and Pro Cut series, I see these as offering a strong sunflower with the traditional appearance that appeals to all kinds of people. Hence, they are easy to grow and sell. They are not finicky about when you grow them, and there are plenty of color choices among the two series. If you want just a basic sunflower, this is a good place to start. Over time, you will surely want to try others and eventually you'll find the combination that is right for you. Lynn Byczynski was growing organic vegetables and cut flowers for market when she decided to create a magazine that would help market gardeners nationwide share experiences and information. Her first issue of Growing for Market appeared in January 1992, and GFM has been published continuously ever since, becoming renowned in the market-gardening world for realistic articles that provide practical, how-to information about growing and selling produce and flowers. Lynn and her family have been growing vegetables and cut flowers since 1988, selling through CSAs, at farmers' markets, to chefs, grocery stores, and florists. They currently grow cut flowers and hoophouse tomatoes on about 2 acres of their 20-acre farm near Lawrence, Kansas.